Read my HLG 550 review and find out how this quantum board can replace a 1000w HPS and give you better yield and quality with half the watts. 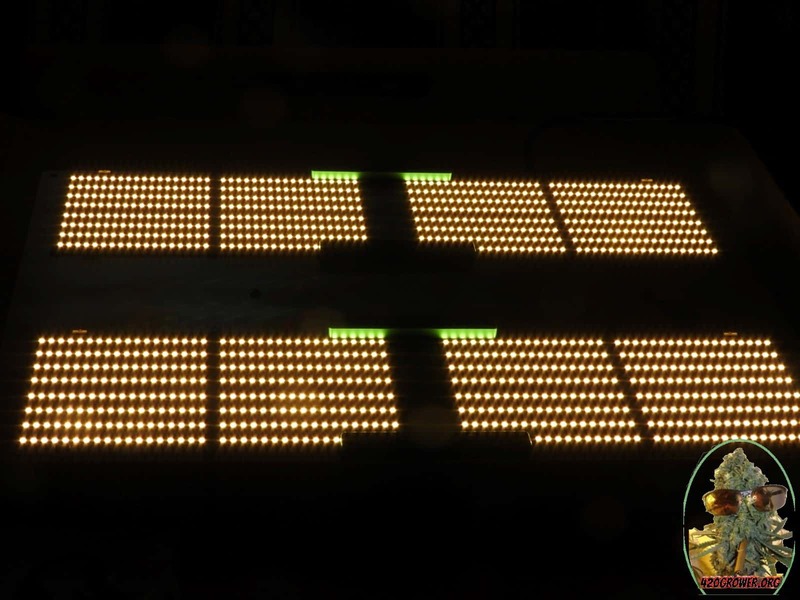 LED lighting is evolving and getting better all the time. I have been growing with LEDs for about 5 years. I started out with a Platinum 600 and it was pretty powerful. It was predominantly red and blue or a blurple light. Worked pretty good but had its issues with bleaching and bud size because plants evolved under white light not blue and red. So the HPS was still the gold standard and cheap Chinese LEDs all but assured things would stay that way. Many were convinced LED lights would never work. 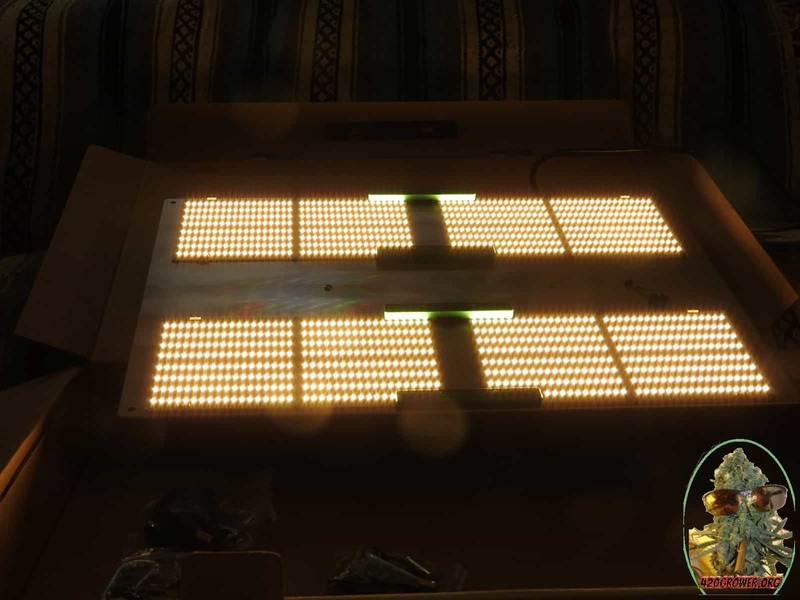 Just so you know, white light is not really white. That’s just what our eyes can see. But a plant sees all the colors in the rainbow and that is what white light is, the full PAR spectrum. PAR stands for photosynthetically active radiation and is the spectrum or wavelength that plants use to grow. The closer we can come to the suns spectrum the happier plants will be. From blurples I evolved into growing with COBs which provide a full spectrum and plants grew very well under these lights. COBs were king for growing cannabis and I still use mine but mostly for veg. Enter quantum boards. Much better light spread and penetration, and a great white spectrum thanks to Samsung diodes. King of the hill for now but science marches on so eventually something even better may come along. So for now I am using quantum boards. After firing up the Horticulture Lighting Group HLG 550 I can tell you they blow COBs out of the water. While a COB (chip on board) was a collection of multiple small LEDs in one concentated spot we now have quantum boards with multiple full size chips arranged very closely on a board. 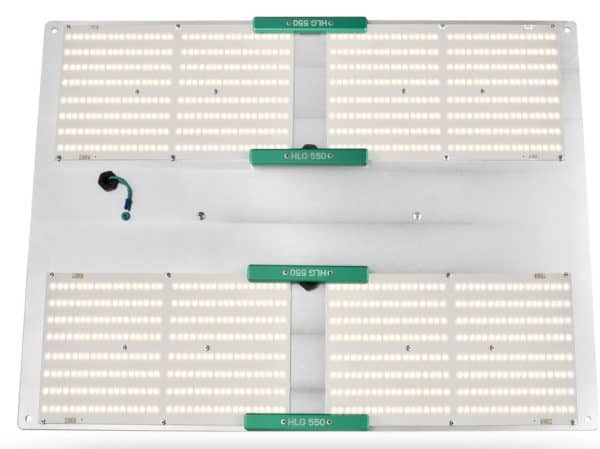 They can produce more light with less watts than any other technology and yes they can replace a 1000w single ended HPS. 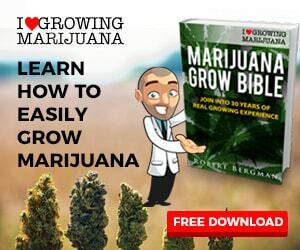 I see there are other online reviews for the HLG 550 but very few show it growing cannabis and lets face it – that’s what you want it for. In fact I would say very few reviewers actually own one or have ever actually seen one. Most are just trying to sell you a high ticket item. 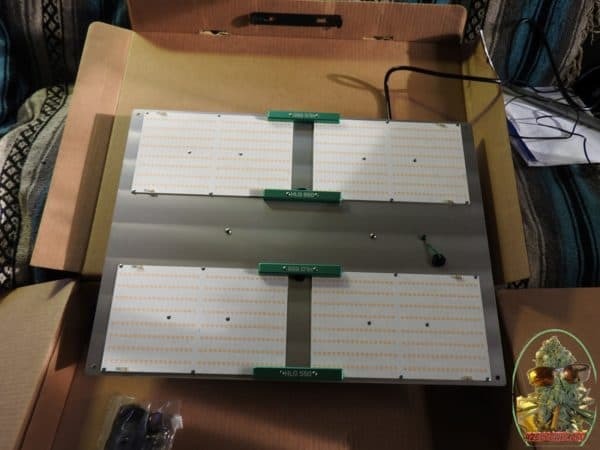 So if you want an honest review from someone who grows cannabis and actually uses this quantum board stick around for this HLG 550 Review. And yes, I would love to sell you one but only after you are convinced it is the right choice for your grow. So lets start at the beginning and unpack this bad boy. This light is so bright that my video cam can’t handle it and overcompensated by making everything dark, even the room it is in. The lights on pictures were shot in full daylight on a sunny day. OK so now lets get down to the meat of the matter. I am not a videographer as you can see from this HLG 550 Review video. It is pretty hard to take par readings and shoot video at the same time but I think you will get an idea of what this light can do. 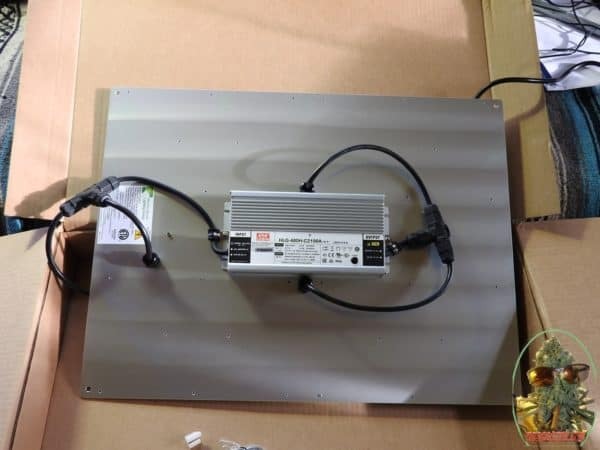 Can The HLG 550 Match A 1000w HPS? That is the big question and I put it to you that it can. Below are 2 par charts. On the left is the HLG 550 at 22″ over a 4X4 and on the right is a HPS over a 4×4. 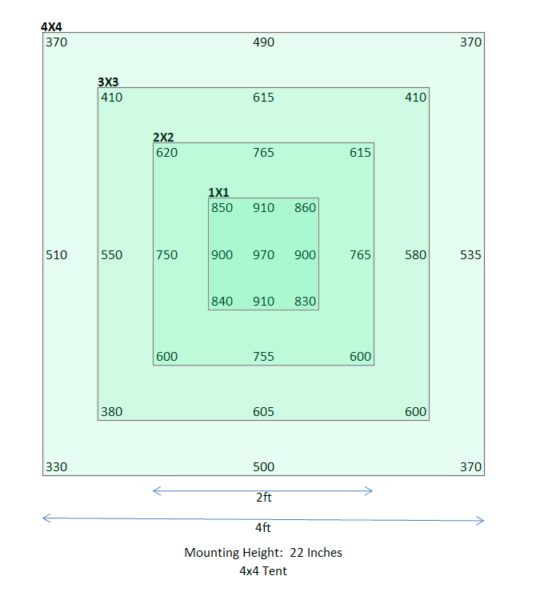 The mounting heights are not exactly the same but very close. Also bear in mind the Eye Hortilux is probably the best bulb money can buy and even still these lights degrade in quality so much that most commercial growers replace them after a single grow. So what you see is not what you get for very long. You dont have to be a rocket scientist to see even the par levels at the corners are lower than the HLG 550 using a new bulb and an efficient reflector. In fact the HPS readings are lower across the board. 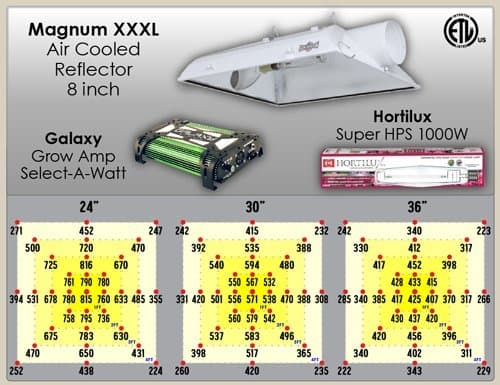 So the HLG 550 has higher PAR levels than the 1000w single ended HPS. Remember PAR measures the light that plants actually use. It also offers a much better spectrum, puts out much less heat and the light doesn’t degrade.